Posted on September 20, 2013 by Patricia Tilton •	This entry was posted in Children Facing Trauma, Perfect Picture Books, Susan Farber Straus and tagged Anxiety, Children, Courage, Fear, PTSD, Trauma. Bookmark the permalink. Enjoy your SCBWI conference, Pat! I am passing the name of this book along. Thanks Wendy, I did. This is an excellent book for parents to have on hand. Enjoy the conference. How many pages is this, Pat? Is it a typical picture book format? Is it the sort of story one would use one-to-one with a child or is it suitable for a whole class? Joanna, this is a 32-page picture book and follows the PB format. It is narrated by a child, but featurs four children throughout in the illustrations. They all have a part to play. It is very well done. Magination Press publishes for the American Psychological Association. For example, the child says “My therapist listened carefully about the thing that happened to me.” But it is still the child telling what he/she’s learned. It’s gentle and not preachy. Lots of showing in the illustrations. I would use it one-on-one with a child depending upon the circumstance. But, if it involves something that impacts a lot of children (i.e. disaster, tragedy)it could be used in a classroom with a teacher/counselor. Have a fabulous time at the conference! There was a sad story in our area about a child who died after a hit and run accident on his bicycle. His school was making a grief counselor available to his classmates. I wondered how many would take the time out of a busy school day to talk with the counselor? This book would be a good tool to help bridge the gap for kids who might hesitate to ask for help without a 1:1 facilitator. This book would be an ideal book to bridge the gap. It is very child centered, warm and friendly. The situation you described is a perfect example how a book like this could help. This book sounds so important for kids to read! and know about. ESPECIALLY the teachers and guidance counselors. I WANT to read this book! Thanks so much for making this choice for PPBF. Thanks Clar. With the Sandy Hook incident, the schools destroyed by tornadoes, child abductions and so on, this book is very timely. It could be used in many different ways by a parent or teacher/couselor. 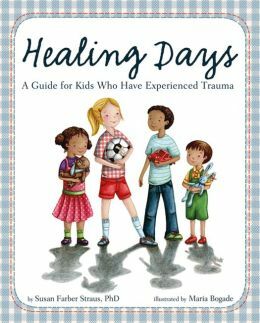 This looks like an excellent resource to use for kids who have experienced a trauma. Might it also be used with groups of kids, to show them what to do if they do experience something like this, or might it just upset them? No, I don’t think this book would upset children — it’s very warm and friendly. The child is talking (really four with different issues). It would be good to use with a child to let them know that they can come to you if something upsets them and that you will be there to listen. I hope you had a wonderful time at your conference. Thanks so much for sharing this book. It sounds like one that every school counselor should have in their collection. Thank you Penny, I did have fun. This book would be a welcomed addition for any school counselor’s collection. It’s a gentle book. Hope you’re enjoying yourself at the conference, Patricia. A much needed book – thanks for introducing it! Glad you liked the selection. The timing was right to share it. Yes, I did have a nice time at the conference. So sad to realize that there are many children who have experienced trauma, but good to know there are a growing number of resources to help. Thanks for your post! You are welcome Jarm. As hard as some topics may be, I hope to show books that may help parents and teachers work through difficult times. Much needed book for the world we live in. Yes, I agree Cupcake. Looking back over the past year, there have been some big challenges for kids. Nice book for parents and counselors to have on hand. That’s wonderful, Pat. It seems to be like a lot of these problems could be avoided with a bit more pro-active behavior and vigilance. Everyone seems so good at reacting but it’s not enough. Probably so, but when you’re dealing with a tornardo that destroys a school and children lose lives, nature is a culprit. There are so many issues that children face today, that we didn’t. I’m glad that book like this is available to parents and counselors. Yes of course. Nature has become quite fierce recently. Wow. This is an amazing and challenging concept for a picture book. I look forward to seeing it in person. Have fun at the conference! Thanks, I did! I hope you check the book out. It is a challenging concept to address, but it is very well done. What a very important and much needed book. Great choice for PPBF. Hope you are enjoying the conference, Pat! Thank you Diane. It is an excellent book! What a good choice. I don’t think I’ve seen PBs that deal with this subject. I think this book would be very helpful to some people, sadly. Yes I agree, Erik! But, if you look at last year alone, there were a lot of children facing challenges — and this book covers a wide spectrum of problems. Glad you liked the selection. When I saw it, I knew I needed to review it for PPBF. Great resource for kids, parents and teachers. Looks like MY kind of book. I am going to order it directly. Thanks for the lead! Thought you might like this one Barbara. This just was released. There is another book coming out for the kids of Sandy Hook, but they are giving some time and space before the release. Can’t remember the author or publisher. You might keep a look out for it. Looks absolutely brilliant. How important and relevant. Yes, I felt it was a very relevant book to review right now. It was recently released. Another important book for parents and educators to share with children. They need books that are not so clinical but that the children can relate to. Thanks, I will be keeping this book in mind. Oops, thought I responded to your comment. I’m glad you see the book as an important one for parents and educators. I was very impressed with the book. Thank you for sharing on Twitter. I hope you had a fun time at your conference! This book looks great. I often encounter kids who might benefit from this. Thanks for sharing. Rhythm, good book for you and your mom to know about. May be useful to you some day. Yes, I’m thinking it might! Thanks! This looks like a good book for anyone. Kids and parents. Love books like this. Thank you for stopping by. This is a very moving and soothing book for children. I imagine it might help older kids to talk. And, there are parents out there with secrets too. It is an excellent book!